Dont let a crushed coupling take your hose out of commission. Replace damaged male hose ends with a heavy-duty brass and zinc coupling that offers superior durability for active job sites. Non-corroding stainless steel screws wont strip when tightened onto your hose. Leak Free Connection has triple watertight seals to prevent leaks. The system uses a quick tool-less connection: push, turn, and lock. The system is very convenient, with automatic shut-offs built in to stop the flow of water when disconnecting/changing attachments, a powerful spring holds up to 100 psi of back pressure, and the connection has a comfort easy grip. The system is also very durable as internal seals reduce o-rings exposure to the elements creating less wear and longer life, and the connections are made of durable metal with a protective overmold coating. Nelson Heavy Duty Zinc with Rear Trigger Cleaning Nozzle The Master Series of nozzles is designed to look more like a gardening 'tool' than other nozzles. Constructed from durable metal and designed with an ergonimic GripGuard over-mold for continuous comfort during extended use. 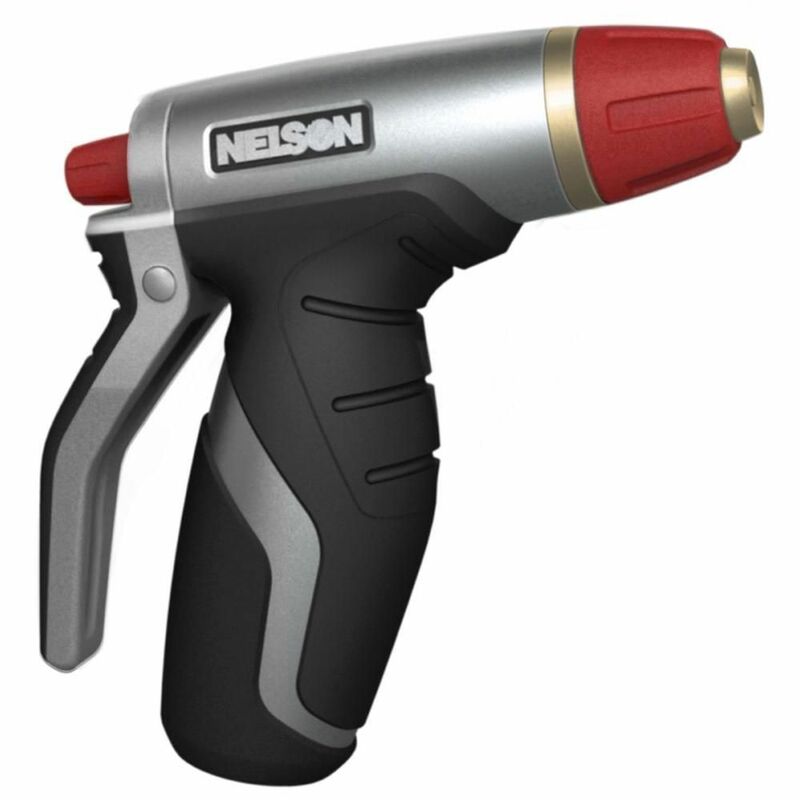 Nelson Heavy Duty Zinc with Rear Trigger Cleaning Nozzle is rated 1.0 out of 5 by 1. Rated 1 out of 5 by Islander1 from Do Not Buy This Product Do not buy this nozzle. I was dragging my garden hose with this nozzle attached at the end. It caught a branch on a bush and, I tugged it with very little pressure but snapped the head off. The head itself is made of a sturdy plastic and brass, however, the stem that attaches it to the body is fragile. I bought this before I read the reviews and realised that I may have to treat this item carefully. I got one use out of the nozzle (washing my car) and then the break happened; I don't consider dragging a garden hose across a lawn area is anything out of the ordinary and if it snags, it shouldn't break so easily. It is NOT heavy duty.